I love what I do, and this gives you the lowdown on what I do, and how I do it! The photo frames have removable easel back and strut leg boards that slide in & out of their pockets, plus pocket for photo and photo sleeve made out of acid free, clear sheet protector from the office supply store, and if you want glass, I can get that cut to the photo's size - they come in 6 sizes, however I can customize the shape and size of all parts to fit uniquely shaped photos, etc - these are made with fabric, sewn, and are washable. I also can washable, no sew, fabric picture frames, and so can you. I use common, household and craft store supplies, that anyone can get. ePatterns are available for $1 each pdf, you print the patterns, formatted to size, to fit on a standard 8.5" x 11" sheet of paper, then transfer to the supplies that I list, like iron on fusible web, art boards or cardboard, sheet protector - all things that you can get in Joann Fabrics, Michaels, AC Moore, or any fabric or craft store. I use mat board for the easel back and strut leg boards, and you can get them at AC Moore or Michaels, Utrecht, even the Super size Joann Fabrics sell mat board scraps in their framing departments. The fusible web is by Thermoweb, sold at Joann Fabrics, Michaels, etc., I buy the roll with a coupon, you can use Ultrahold, which is acid free, or Featherlite- they are used as your patterns, and give strength and structure to you finished parts that you sew or glue together, and they're so easy to work with. For the no sew, washable, fabric picture frames, I use a good, quality hole puncher, or you can use a pair of sharp, pointy embroidery scissors to make holes marked, just follow the instructions on the patterns in the epatterns, on where to place the holes, because you will lace that skinny, 1/16" ribbon through the holes to join 2 of the finished parts, that will allow you to have a pocket in the front for the photo and it's clear sleeve, and this will also allow you to join 1 of these parts to the back panel, to allow for your easel back board to slide in and out. Then you can use hot glue, or scrapbook tape to join the finished parts, if you don't have, can't, or want to sew it all. Costume jewelry, accessory, washable, sewn, fabric brooches / buttons / badges are washable, have a back panel w/ 1 or 2 holes for military clutch or bar pinback to stay in place, front and back panel make pocket for pin back to slide in and out of. Art can be printed on inkjet fabric, handpainted, beaded, or printed using Spoonflower.com fabric printing services. ePattern pdf patterns are available for $1 each, to make your own, printing them on only 1 sheet of 8.5" x 11" inkjet fabric, with instructions on that sheet, and minimal extra supplies are needed, just 6x9" adhesive, paper backed, fusible web, coordinating thread, a good quality hole puncher, an inexpensive pin back, plus 1 sheet of inkjet fabric. If I make the brooches, they cost between $1 to $20 depending on the type of fabric, design, complexity, if any beading is done, etc. The dog accessories currently are for Yorkies and pugs, but if you have dimensions of your dog's back from neck collar to top of tail, chest and waist circumference, I can make a pattern or possibly epattern with instructions for you to make them yourself. -if you want art / design patterns on a fabric repeat, to cut and sew, you can go to spoonflower.com/profiles/fabricatedframes where I can format the design on the pattern to cut out, because some patterns are way to big to fit printin through your 8.5" x 11" inkjet printer, like the dog accessories, for example, however I can get one made for you for about $20, including printing, and sewing it up. -for DIY crafters who are dog lovers, if you want the patterns or epatterns, the supplies to make them are all available at Joann Fabrics, Hancock Fabrics, and anywhere that sells knit, dancewear, cotton flannel, denim or bottomweight fabric, and notions. Oven mitts are the typical regular sized oven mitt gloves 8" wide at widest across, and 10" long from top to cuff band edge. They are lined with ironing board utility fabric and diamond quilted fabric with batting between layers, and have a loop for hanging, and edge banding to finish the cuff. Custom cuff designs can be printed and made. Custom art can be printed and made. 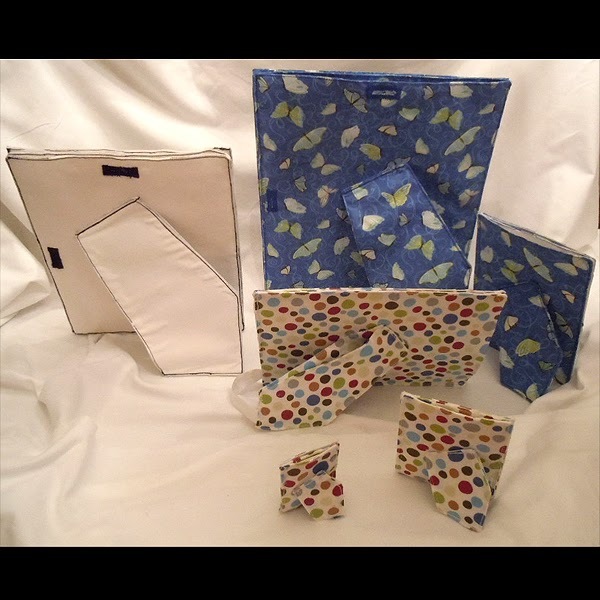 House shaped kitchen mitts have a house shaped base, with a pocket on the front, ironing board utility fabric on the back, diamond quilted fabric with batting inside, on the inside, and custom art can be printed and made for the house shaped base fabric and the pocket design. ePatterns are available for $1 each, pdf download with 4 pages of patterns and instructions, some you can print on 2 sheets of inkjet fabric with my art or design patterns, formatted to size, to just print, cut, and sew, for the front and back of the oven mitt, or house shaped base and front pocket design - that pdf would be 5 pages. Holiday or Christmas tree ornaments, which could also be used for door hangers, stuffed, or used as sachets. Double sided washable, sewn, fabric ornament, with $1 epatterns that you can print and make yourself, with all sorts of designs and art, printed onto inkjet fabric or printed on Spoonflower.com digital pigment based print fabric services. Just add a ribbon, and use coordinating thread. Also, I've made zippered covers for scrapbooks and albums, wedding, baby, and event items, photo wallets and dvd/cd wallets with removable clear sleeves velcro'd in, kitchen linens, art and product licensing, interior design services (what I have an associate degree in), premiums, and more! advertse your banner link for your site, or business ad image, for $5/yr, $1/month on fabricatedframes.com - get a free gift! subscribe to fabricatedframes.com, and get a free epattern each month for a year, $1/year! Subscribe for more than $1/year, and get a better gift! www.lulu.com/spotlight/fabricatedframes - my DIY fabric photo frames instructions and patterns book, "Fabricated Frames: Instructions On Making Fabric Photo Frames", $11, for 2 structure types, non-washable, and washable, sewn, fabric photo frames, with patterns for the struts (legs) for 6 sizes for each structure type, and dimensions to cut all parts for all sized frames mentioned, patterns and photo step by step instructions for both. At the stores / links below, you can buy my art on things like 5x7 feet or 3x5 feet area rugs, bedding like duvet covers and pillowcases, napkins, picture frames for 4x6" photos, shower curtains, drapery curtains, flip flops, electronic cases, diaper bags, stationery, pet accessories, and other products below, frequently on sale 30-40% off! It's amazing that http://cafepress.com offers so many products that can have custom art on them, especially home decor, accessories, and home furnishings. So, on http://www.cafepress.com/KristieHublersCafepressAreaRugs you can get my art on 5x7 feet area rugs, and 3x5 feet area rugs. I've sold 2 so far, and each 5x7 feet area rug is regularly $172, but they are frequently on sale from 30-40% off, which is a great deal! 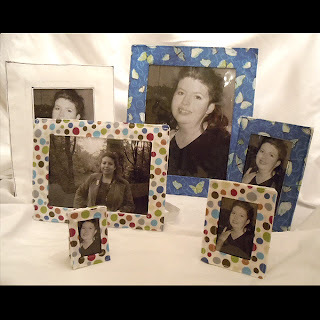 I promote any sales, on any given day, with promo codes listed on my http://twitter.com/fabricframes profile feed. A few weeks ago, the 5x7 feet area rugs where on sale for $98, and on top of that, at the time, the customer could also apply a promo code for them to have gotten another 30% off! 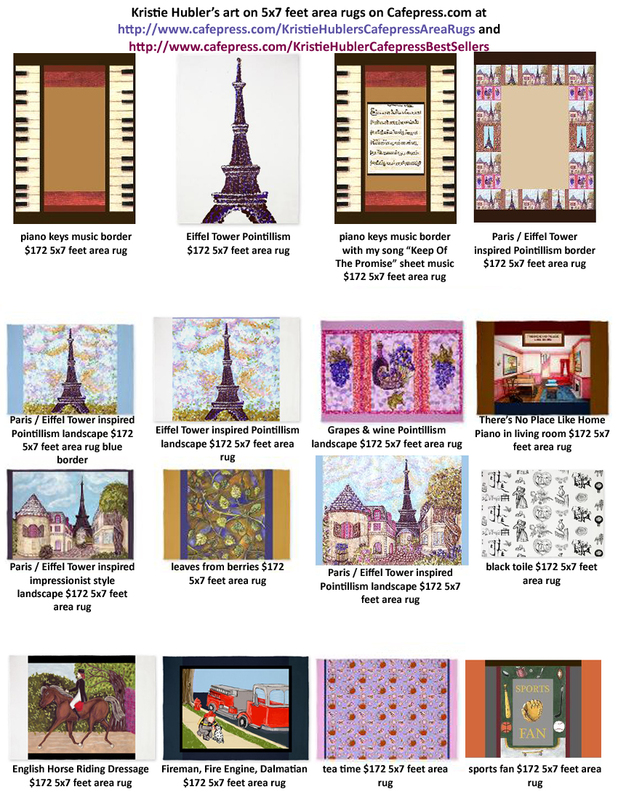 I have all kinds of art and patterns added, all kinds of styles, colors, from inspirations of Paris and the Eiffel Tower, to wine and grapes, sports, horses, landscapes, patterns, interior perspective renderings, music, piano, pointillism, impressionism, nature, leaves, baby, sheet music, and more. 30% off at http://www.cafepress.com/KristieHublersCafepressBestSellers #bestsellers #best #sellers #art #bedding #duvets #showercurtains #rugs #trays #curtains with #code SPROUT sale on until tonight at midnight!